Increasingly, I am staying in B&Bs as I travel round the UK, rather than booking into predictable and boring international hotels. With the help of a quirky directory, Mona has found me some brilliant places to spend the night. And if, occasionally, the house doesn’t live up to its hype, well, that can be an adventure too. Last night’s hotel was a great mixture of superb and frustrating. They had lost my booking at the ‘Raj’ in Edinburgh, but managed to offer me a room nevertheless. And what a great room. 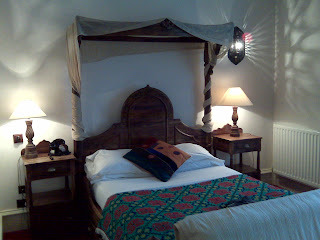 The whole hotel is ‘themed’ with each room decorated in the style of a region of India. Mine was the Jaipur. Breakfast was a bit strange. Not the contents, which were standard fare, but the fact that the dining room had only armchairs and coffee tables available – so all the guests ate their meals balancing bowls of cereal on their laps.